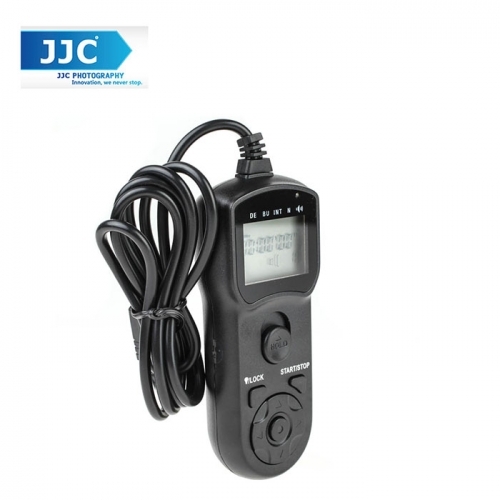 JJC TM-F2 timer remote controller is designed for Sony camera adopts a multi interface. The timer remote controller provides a trigger function and can activate the bulb function on. This remote controller is designed to reduce camera shake to an absolute minimum. The remote has a two stage release button, half-press to focus, fully press to trigger the shutter and take a photo. For long exposure, press the release button fully and slide it into the locked position. The timer can be set anywhere from 1 sec. to 99 hrs., 59 min., 59 sec. The maximum number of exposure is 399 or infinite. In addition, press the LOCK button for 2s will lock the panel to prevent you carelessly stop a running timer. The humanized backlight allows you see the LCD display even in a dark condition. JJC TM-F2 replaces Sony MULTI Connector. remote and an intervalometer. It is excellent for flower blooming, sunset, moonrise, etc. you to take creative pictures.